If you tried to distill all the technology and trends from RSNA 2011 into one single solution, the service would probably be a cloud-based, dose-monitoring and dose-reduction app for an iPad or Android tablet (which actually seems like it would be useful). In addition to excluding the vast array of scientific presentations, Radiology Today’s list of things to watch in the coming year purposely excludes the economy, which held a spot on our list since its debut a few years back, and reimbursement because it is always being watched. It’s also good to discuss some different issues. 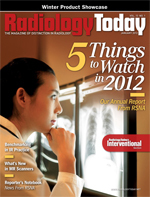 So, with those caveats in place, here’s our list of five things we saw at RSNA 2011 that merit watching in 2012. These newer competitors in the imaging services market are manifesting in several ways. A few teleradiology companies are positioning themselves as national radiology practices. Large regional radiology groups want to expand their market share, too. There are also imaging management companies that will gladly replace the current group at a hospital. And, finally, more hospitals are looking to bring radiology services in-house; you and your group may or may not be invited. While these four alternatives to the traditional local radiology group still represent a relatively small percentage of the imaging services market, not too many years ago, such competitors held a marginal place or did not exist at all. Local radiology groups that truly provide good service have an advantage over such outside providers, but those groups need to remember that referrers have a larger role than providers in defining what good service means. Your definition of good services may not match your referrers’ definition. While most contracts seem to be lost because of some sort of service dissatisfaction, there have been reports of cases that were largely driven by economics. Muroff told the RSNA audience that some so-called predatory radiology groups are cold calling hospitals with the pitch that they can deliver services better and cheaper than the existing group. The best defense against that tactic is good service to referrers. Smart hospital administrators will think twice before replacing a group generally liked by its referrers, but the promise of imaging savings alone can displace a group. Some hospitals want to bring imaging in-house by employing their radiologists, operating the practice, and keeping a larger slice of imaging revenue. The incumbent group may or may not be offered employment. Such an arrangement represents an opportunity and a risk for a hospital. Hospitals would welcome a larger chunk of the imaging profits. In addition, many hospital administrators bristle at the fact that they often have to compete against the radiologists they contract with in the outpatient imaging marketplace. Employing the radiology department can help achieve both of those objectives. But there is one huge caveat about this strategy that hospital administrators need to consider: Hospitals traditionally have done a lousy job of managing outpatient medical practices. If you remember the onset of managed care in the early 1990s, many hospitals overpaid to acquire medical practices, ran them inefficiently, and then sold them back to doctors within the decade for pennies on the dollar. Running an inefficient practice in an era of declining reimbursement is not a winning strategy. Administrators who replace a radiology group that is generally liked by referring doctors run the real risk of two imaging transitions rather than the one they bargained for in the deal. While the aforementioned practice models represent a modest percentage of the marketplace, teleradiology also affects how traditional practices operate. Teleradiology started by providing preliminary reads when a group’s radiologists were not on duty. Telerad companies began offering final reads in the mid-2000s. The percentage of final reads expanded to an estimated 15% in 2008 and is growing. Some radiology groups view companies that provide only preliminary reads as less of a threat to their future. The reasoning is that once a telerad firm starts providing final reads, it is perceived as a threat to displacing an existing group. Others see it differently. Greg Rose, MD, PhD, president and CEO of Rays, Inc, believes radiology groups best serve patients and themselves by utilizing final reads for night and weekend coverage. Rose believes the radiology group ultimately is better served by providing final telerad reads than having a partner do a second read the following day. Rose believes radiologists’ time would be better spent developing and handling new business to grow the practice. Many experts believe that radiology groups growing their practices represents one of the best ways to maintain their autonomy in coming years. • The court will decide whether Congress was acting within its constitutional powers by requiring all Americans to have basic health insurance. • It will determine whether other parts of the law can be implemented without the “individual mandate” to have health insurance if that aspect of the law is found unconstitutional. Lower courts have ruled differently on this issue. • The judges will rule whether Congress is improperly coercing states to expand their Medicaid coverage. • The court will also determine if the issue is even ripe for deciding. Lower-court judges have ruled that the penalty paid for not having insurance is the same as a tax and, under the federal Anti-Injunction Act, cannot be challenged until someone must actually pay that tax in 2015. The ruling could greatly shape the future of healthcare in the United States—or not. The Supreme Court frequently offers very narrow rulings that lack the impact that many anticipate from a high-court ruling. But because of what the ruling might mean, everyone will be watching closely this spring. 3. Is Your Practice’s IT Capability Good Enough? That may be the question of the year in radiology. Given increased competition and tightening reimbursement, the answer to that question may be key to a group’s success in coming years. Big practices that cover large physical areas tend to have better IT infrastructure to effectively share images, reports, and other information with referrers, hospitals, radiologists, and patients. Teleradiology companies develop and utilize their own sophisticated systems to efficiently serve their far-flung clients. Such systems raise the bar for service to hospitals and referrers. IT also provides the opportunity to operate more efficiently, increasingly important given the forecasts of reduced reimbursement for radiology services. As healthcare reform unfolds, quality measures and other quantifiable business intelligence will become increasingly important. Unfortunately, as Muroff pointed out, it is one area where most radiology practices do not stand out. “Most [groups] will not have the IT capability to compete and will thus be vulnerable. That is especially true for smaller practices,” he said. The forecast inside McCormick Place was cloudy. Cloud-based computing services, particularly imaging archiving and sharing, were everywhere in Chicago. The trend toward larger practices and healthcare organizations as well as more integrated care all create an environment that supports the growth of cloud-based services. In the presentation, Kovacs discussed how cloud computing can address obstacles revealed when exchanging patient data with its low-cost, secure, near-instantaneous, and vendor-neutral characteristics. Image and information exchange as well as archiving are the primary cloud uses in healthcare so far. According to one cloud services provider, larger hospital organizations are adopting cloud technologies more rapidly thus far. “We’re seeing larger [hospital] systems switch to the cloud when it’s time to upgrade [storage technology] as well as with mergers and acquisitions,” said Matthew Mong, vice president of marketing for GNAX Health. It seemed that nearly every modality vendor was showing a new mobile X-ray unit at RSNA, and a fair number of them were painted to resemble giraffes. After asking around, there was a pretty good explanation about this veritable herd of mobile units. It turns out there is a fleet of approximately 12,000 aging GE Healthcare AMX mobile systems out there. Many of those workhorse units will be reaching the end of their life spans in the next few years. In addition, many facilities are looking to convert their entire radiology department to direct DR in the next few years. These are two reasons companies want to have a potential replacement for those analog and CR mobile systems in their product portfolios. The same mobile X-ray product manager noted that it’s common for a decent-sized hospital to have five to 10 mobile X-ray units and that it also makes sense to work toward having all a facility’s radiography equipment on the same platform. At the head of the list to replace those aging AMX units is GE’s own Optima XR220amx system, which brings the company’s direct DR capabilities to the latest version of the AMX system. Fuji, Siemens, Carestream, Canon, and Shimadzu are among the companies showing mobile DR systems. In addition to new mobile systems, several vendors are also offering DR flat-panel upgrade kits for existing mobile X-ray units. It will not happen all at once, and CR systems won’t suddenly disappear, but the movement toward direct DR is under way and will include mobile X-ray.